For more from the author, see “where the price of convenience is strangeness” in Hazen’s Seven Eleven Forgotten and Other Stories. I’ve been in Taos, New Mexico for the past 15 years. The only other place I’ve lived for this long is Los Angeles—I was born there, and lived most of my twenties playing in bands and writing. 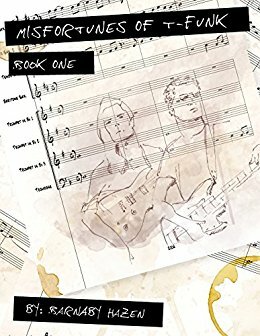 This book is the first in a series about a couple of musicians and their obstacles. I have enjoyed many good movies and biographies about bands and musicians over the years—as well as fictional depictions of the lifestyle—but I’ve always felt there was something missing, at least compared with my own experiences as a musician; sort of cracks in the sidewalk the public is unaware of. And so this series, Misfortunes of T-funk, is just that—a trilogy calling to light things people might not have thought about in the world of performing and recording music. I’ll give you an example—a knob breaks off of your amp just as you’re setting off on a series of shows. Now you’ve got to either stop off at a shop along the way somewhere, and see if you can get a rush repair done on the item, or more likely you just grab a pair of plyers and have one more annoying detail to work around at every gig you play. It’s not a problem you can easily romanticize, or that you’d even necessarily give a second thought to, until a dozen other little things happen and you still have to get from one gig to the next and do your thing and mean it. For me I’ve known these things can be very humorous to look back on, though not necessarily while they’re happening. So T-Funk brings these overshadowed stories to the reader, while also shedding some light on the dedication and passion it takes to keep going back and writing, recording and performing music, even after bad luck and trouble has set you back countless times before. Usually before I start writing. In a radio interview I recently compared it to acting. Not that I have much experience as an actor, just a couple things in high school, but it seems to me the process of getting into a character for a role you’ll play has much in common with writing about a person you’re making up. If the background is different from yours, you have to reach to get a look inside and find what would be motivating them and these things. What fascinated me while I was writing this was realizing that whether I identify easily with some collection of characters or not, I cannot afford to make any judgements about them while I’m writing. I realized this when a reader was running down her own assessments of a couple of the relationships, and I was shocked by her conclusions because I hadn’t developed any moral framework about it at all. I think that if I did it would taint the water—I have to operate neutrally, tossing the variables in as the story may go, then just watching what happens and writing it down. I don’t think I’ve ever felt I have any choice but to write. I took a long break from writing fiction while I was working on my music degrees, but of course I had to write academically in that time, and wrote a little here and there on the side. But I also created most of the songwriting and composing catalog in those years. So lately, getting back into fiction just feels like returning home. I need notebooks. I don’t really compose on the computer much or anything. If I ever hired a typist, I would feel so bad though—my handwriting is awful, and there are all these arrows that point here and back there and things crossed out then restored, and the words, “insert back,” or “insert forward,” when I think of something that’s out of sequence. It all makes sense to me but I can’t imagine explaining it to anyone. But as for where, I do like writing in warm weather outdoors. Like at a beach, or a park or like that—as long as I’m anonymous. 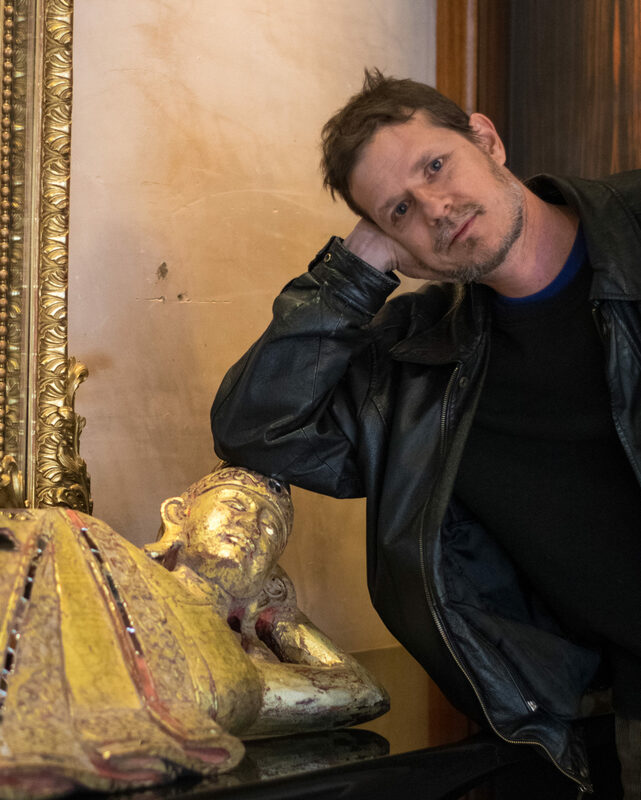 I can’t really expect to write in public in Taos because it’s such a small town, I’ll probably face too many disruptions just with people saying “hi” and all. Sometimes from life, sometimes from dreams. Sometimes it’s just a mood. I’ve felt really low some mornings, then written about something totally other than my life circumstance, to feel purged afterward, as all that was important it seems was to relate the feeling itself. One of my favorite short stories I’ve written to date is “Princess 7,” from my first book, Seven Eleven Forgotten and Other Stories, and that’s how that happened—I felt really low and got this idea about the 7-Eleven sign and wrote a fable. So yeah, my moods inform a lot of what I write. I am trying to read contemporary literature, especially indie stuff. But really, my go to is reading literature of previous centuries. I especially like absurdism and surrealism, or to at least find elements of that in a book. I prefer fiction but also can get on a poetry binge. What would your advice to be for authors or aspiring authors in regards to writing? I would really consider putting off publishing, despite how easy it is these days. I think it’s good to write for a few years for most of us anyway, before we start thinking about an audience or the public. I certainly did. Publishing can be very distracting and I think the important thing is developing a voice, and a relationship to one’s muse first. I love the name of your blog—“Pen and Muse.” The word, Muse—I think it’s underused these days. Thanks for letting folks know about this new book of mine. A lot of hard living led up to it and it’s my pleasure to share some of that with the public. meaning back around the year 2000, though I didn’t have a name for him then – but, I didn’t have much in mind for the vehicle to get him there.